Our goal is to make this a trip to remember and the acknowledgement of the sacrifices made to secure our freedoms. Your service will not be forgotten. Through a group of dedicated volunteers, who have been touched by this mission, we will do our best to pull all the components together to make this a safe and enjoyable trip. To do this we need you to submit an application, discuss with your family and private physician about making this three day trip. We will contact you about 45 days before the next flight to arrange an interview if you are in line for the next flight. 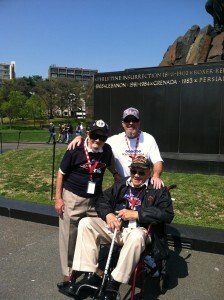 Please understand that you will not be considered without a completed application sent to Honor Flight Southern Nevada. Go to the Applications page and either complete the application online or print out one to complete, then mail or fax in to our address. All veterans must complete an application to be selected for a flight. Once we receive your application, your name will be put on the wait list and we will begin selecting veterans based on service years, age and health. We do not discriminate when reviewing applications and/or selecting veterans. We require certain personal and medical information so our medical adviser and team members can ensure the veteran will physically and comfortably be able to make the flight. For the safety of all on the flight we cannot take veterans who are suffering from dementia or Alzheimer disease. However, we would like to honor these veterans of WWII so please contact us with information on how we can. Spouses are not allowed to go, unless they are a veteran. Please read the frequently asked questions below. Complete and email the application form to administration@HonorFlightSouthernNevada.org, or print and mail the completed form to 2190 E. Pebble Rd. Suite 150 Las Vegas, NV 89213. Forms can also be Faxed to 702-749-5933. We know that you may have some questions before you make a decision on the flight, so we have provided you with some of the frequent questions that HFSN has received during our previous travels. Can I bring my scooter with me? No, you cannot bring your motorized scooter nor should you bring your own wheelchair. HFSN will provide wheelchairs to be used throughout the weekend. Do I get my own hotel room? No. Rooms are assigned as two-person occupancy. We have received requests that a veteran will pay for his/her own room. The idea of this trip is that veterans do not pay for any expense for the trip and HFSD does not have the funds to give everyone their own room. Does Honor Flight Southern Nevada pick me up to take me to/from the airport? No, HFSN does not provide transportation to and from the airport. However, if we know of other traveling veterans that live near a veteran, we may be able to pair people up to ride together. If this is an issue, please contact your team leader as soon as you can. I use oxygen. Can I still come on the trip? Yes, we can assist with oxygen needs. We will need to have the prescription from the veteran’s doctor a few weeks before the trip in order to make the needed arrangements. Pack comfortable clothes and shoes for the trip. This is a very casual weekend. You will be receiving a HFSN shirt to be worn on Saturday which will be yours to keep! 7) I have friends/family in the DC area. Will there be time to visit with them? The best time for that to happen would be either on Friday or Saturday nights at the dinner at our hotel. They can join us at the dinner for the cost of the meal and we can work with them to make arrangements. In addition, after the meal and program, you are free to visit at the hotel. We prefer that you do not leave the hotel with anyone other than Honor Flight personnel. Do we get breakfast on Friday morning? Is there food on the plane? We will have breakfast sandwiches and coffee at the airport. We will also serve a meal on the flight on the way to BWI on Friday as well as a meal on the flight back to Las Vegas on Sunday. Why can’t my spouse or significant other go? This is a veteran program. Guardians that go have to perform heavy work, such as loading and unloading wheelchairs and pushing them all day. In addition, we only have room for a safe guardian/veteran ratio. Often spouses and significant others have similar health issues and we will cannot accommodate more that we already do. How will my luggage be handled? When you check in on Friday morning at the airport, make sure that you have some sort of identifying information on your bag (i.e. name tag). You are responsible for keeping track of your luggage. If you have medication that needs to taken during either flight, HFSN recommends that you have it within easy reach. I need to use the restroom frequently, are there restrooms that I can use through the tour on Saturday? Yes. Each stop that we have has a restroom that we can use. At the Iwo Jima stop, it is only a portable toilet. There is a restroom on the bus if you need to use one at any point. Is there any way we can go to the Marine Corps museum, the White House, Capitol, etc.? We have a set schedule and as much as HFSN would love to go these other places, we just don’t have time to make other stops. I’m the Commander of the Military Order of the Purple Heart Chapter 730, Henderson, Boulder City, and Laughlin. We had the privilege to send our only WWII Veteran to Washington DC last year. I have several Korean Veterans so I’m inquiring to see if you’ve started flight for Korean Veterans? Are you taking Vietnam era veterans yet? We are still working on the last of the WWII veterans and Korean War veterans. However, we hope to be taking Vietnam veterans within a year. WE encourage you to apply and get on the waitlist. We already have a Vietnam veteran waitlist, so please submit your application from this website to get on the list. Hope that helped answer your questions.